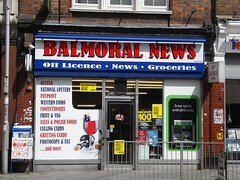 Convenience store, off licence, and newsagent on South End, with a (free) external cash machine. According to a photo on Flickr, as of 1969 the premises were occupied by a business called Balmoral (most easily visible at original size). We don't know if that had any connection to the current business. Last edited 2019-02-07 15:05:25 (version 25; diff). List all versions. Page last edited 2019-02-07 15:05:25 (version 25).